Vivien pushed open the door to the orchard. The wood was crumbling splinters against her palms. There was a sound on the air, a hum between the trees, a buzz, the Om that underlies the universe. It hung before her, sound given body. I wrote this story after visiting our beekeeping friends, Sara and Dave Moore. It was early in a summer’s morning and I went out into the garden. I heard the buzzing before I saw them. A huge ball of bees hung in the air ahead of me. I suddenly felt very small and vulnerable. Afterwards I did some reading about bee society. It’s brutal. 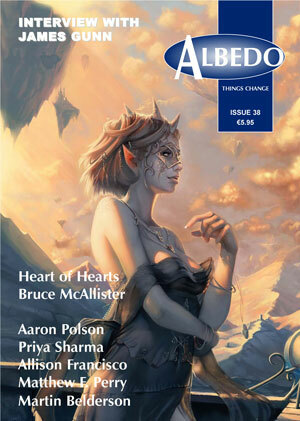 This story appeared in Issue 38 of Albedo One. It received a Honorable Mention in Best Horror of the Year 3(2011) and made Locus’ 2010 Recommended Reading List. Thanks Karen! Good luck with your wasp story. It’s at Albedo One, second time around. I got lucky and Freda Warrington critiqued the first version I submitted. Then., as soon as I followed her advice to cut one character out, I had an epiphany and the whole story got better. It may even have a part II. John Kenny had done the initial review and said the first version didn’t quite hold him all the way through. I hope, this time around, it does more than just hold interest. Thanks for stopping by my website and I look forward to hearing more about your work!